1In this paper one aims at building a normative model for European identity formation dwelling on the Lisbon Treaty (2009) and the Schuman Declaration (1950). However, one is going to differentiate the use of these sources as purely legal documents and their use for finding normative constraints in normative political perspective. In order to build our model, we are going to present our concept of bonds, initially used by Jonathan White in the Political Bond of Europe 2009. By arguing what normative model for European identity formation the Lisbon Treaty (2009) and the Schuman Declaration (1950) set, we intend to recommend what additional measures should be taken at an EU level so that a sense of shared European identity among the EU citizens is fostered. 2We are going to argue that the idea of an ever closer union among the peoples of Europe laid down in the Treaties and the Schuman Declaration represents a normative model for European identity formation by setting the conditions for such a process. We are going to argue which these conditions or factors are by using the concept of bonds. Also, we plan to justify why we can use these documents not only as legal sources but also as sources for finding normative constraints to the ideal of an ever closer union in the normative political sense. 5This dual use of legal sources is not a challenge for this paper but a tool for conceptualizing the idea of an ever closer union. On one hand, we are going to analyze the legal frame that defines the EU context as a social milieu that influences the individual's collective identifications. On the hand, we will argue that the ever closer union is a normative ideal for European identity formation and could be achieved through the functioning of those legally established bonds. We could distinguish between horizontal bonds, on one hand, and vertical bonds, on the other hand. The horizontal bonds regard the ties that are normatively set between the Member States but at the same time they could be built at an individual level in Europe or in other words between EU citizens themselves. The vertical liaisons or ties, on the other hand, build the connection between the European institutions and the citizens of the EU. Also, it is important to note that though all of these bonds all legal in a sense that they are legally set, we are not going to analyze them in the strict legal sense and our classification of bonds will not rely on legal definitions. While our main focus are the horizontal bonds on the individual level, which we will consider to be the foundation of an ever closer union among the peoples of Europe, we still need to make the comparison with the other bonds so that there is no further ambiguity. Thus, below we are going to present the three types of bonds in tables so that we could distinguish between them in a more ordered and visible manner. 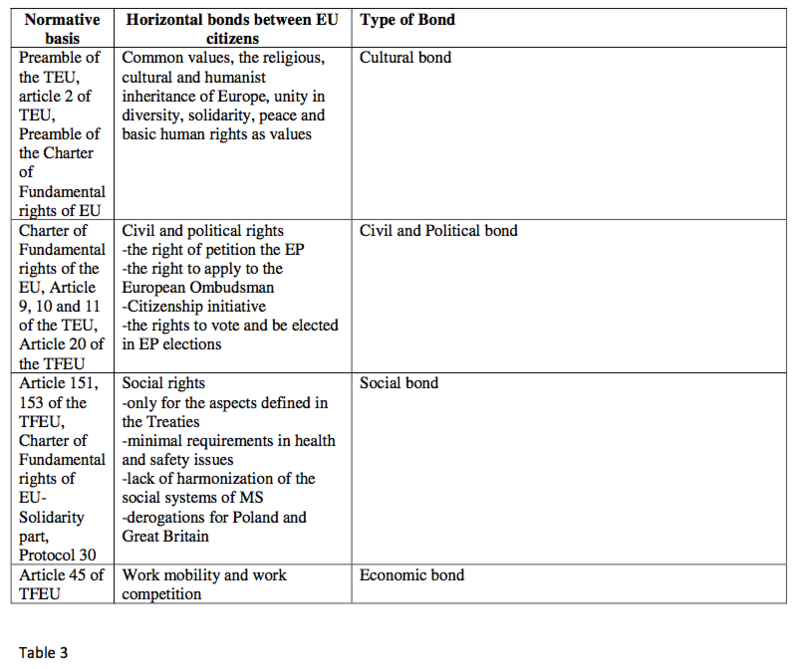 6As already mentioned above, we are now going to analyze in a more thorough way the horizontal bonds arguing that they could constitute and ever closer union between the EU citizens. EU citizens share the same political and civil rights that aimed at guaranteeing their participation in the democratic life of the Union so that decisions are taken as closely and openly as possible to them. If we define some of the EU citizens rights as civil such as the right to access of documentation in one's own language, the right of petition the EP and the right to apply to the European ombudsman, we could define this bond as a set of both political and civil rights. One could also add the fundamental human rights that EU guarantees additionally to its EU citizens through article 6 of TEU that gives The Charter of fundamental EU rights the same legal power as the Treaties have. The adoption of the Charter could be seen as an attempt to guarantee these rights on at an EU level proclaiming that there is a EU normative document dealing with the matter of fundamental human rights. One has to take into consideration, however, that the Charter is not applicable in certain aspects for some Member States. In particular, we are going to discuss Protocol 30 when analyzing the social bond. 7What presents a special interest to the conceptualization of the ever closer union are precisely the economic and social bonds. First, they are mutually connected and second they are an essential part of the functioning of the free market and the free movement of persons which is one of the basic economic freedoms lying at the core of European integration process. The economic bond refers to the economic mobility of EU citizens, who according to Article 45 of TFEU ''in the quality of workers have the rights, subject to limitations justified on grounds of public policy, public security or public health, to accept offers of employment actually made, to move freely within the territory of a Member State for this purpose, to stay in a Member State for the purpose of employment in accordance with the provisions governing the employment of nationals of that State laid down by the law, regulation or administrative action, to remain in the territory of a Member State after having been employed in that State, subject to conditions which shall be embodied in regulations to be drawn up by the Commission''. Moreover, Article 45 proclaims that "(1) freedom of movement of workers shall be secured within the Union and (2) such freedom of movement shall entail the abolition of any discrimination based on nationality between workers of the Member States as regards employment, remuneration and other conditions of employment". Тhe mobility of workers is one of the 4 freedoms together with goods, services and capital which, regarded purely from the economic perspective, has to secure the functioning of the common market. We could call this particular horizontal bond an economic bond or a competition bond as it binds together all EU citizens as participants in a common labour market under common competition conditions and it prohibits discrimination based on nationality. The limitations to these rights on grounds of public policy, public security and public health have been carefully scrutinized by the European Court of Justice in its jurisprudence. The limitations grounded on public health, for example, concern only the entering or leaving of a country but not the permanent residence in it. Also, a list of illnesses exists. When it comes to public policy and the different positions that could be taken, only those positions where power and decision making is required, are subject to limitations. As to the public security, the Court has followed the line of addressing each case individually by judging the behavior of the person concerned. This approach of the Court justifies the importance of free movement of persons as a core EU citizen's right whose limitation is carefully scrutinized and controlled in judicial terms. 8As to the social bond, one can say that this is probably one of the most controversial and not fully completed bonds between the EU citizens. It is not full because there is no harmonization of the different social systems of the Member States or a common social system. 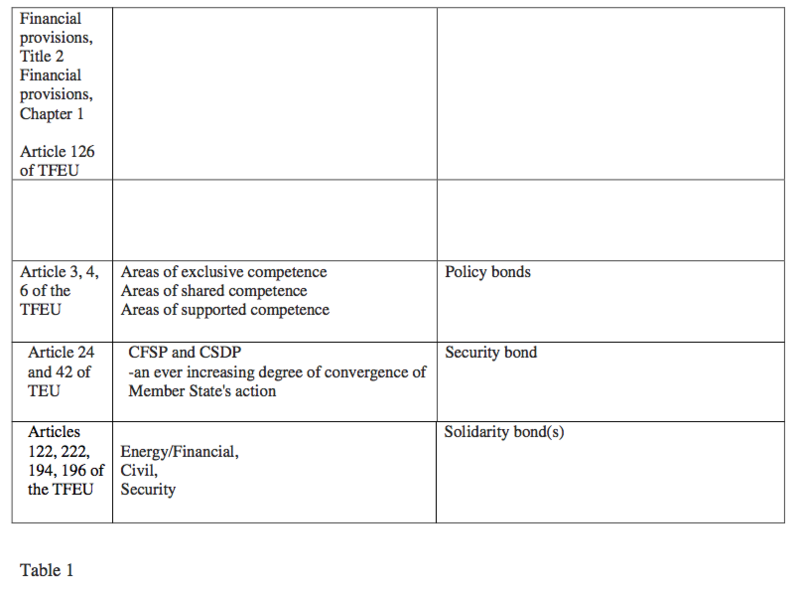 Moreover, Article 4 (b) of TFEU defines that social policy is a shared competence, in the aspects defined in Treaty, as it is the regime for all other shared competences. Later in the TFEU, we could refer to Articles 151 and 153. Article 151 sets the goals regarding social policy on EU level such as promotion of employment, improving working and living conditions so that their harmonization becomes possible, social protection etc. However, the article is very clear that when the Union and the Member States shall implement measures they have to take into account the diverse forms of national practices. Article 153 is very important because it clears out what legislative procedures in the different aspects mentioned in the same article are going to be used. One could see that the ordinary legislative procedure regards adopting decisions aimed at supporting the exchanges of information and good practices as well as adopting minimal requirements only in the health and safety issues of the workers and equality between men and women. The Council, however, shall act unanimously when it comes to social security and protection of workers, protection of workers when their contract is terminated, representation and collective defense of interests of workers and employers, including co-determination, conditions of employment for third country nationals legally residing in Union territory. This division between legislative procedures gives more insight which aspects of social policy are a matter of great sensitivity, particularly those where the Council acts unanimously. The social bond between EU citizens is not full because there are substantial differences behind the philosophy of the social systems in each country. The Charter of Fundamental rights of the EU includes a Solidarity Chapter which contains the ideas of the European Social Charter signed in Turin 1961 and 1989 Community Charter of the Fundamental Social rights of workers. Though the Charter has the same legal power as the Treaties, Protocol 30 is added to define special conditions to its implementation in UK and Poland. According to Article 1(1) of the Protocol: "The Charter does not extend the ability of the Court of Justice of the European Union, or any court or tribunal of Poland or of the United Kingdom, to find that the laws, regulations or administrative provisions, practices or action of Poland or of the United Kingdom are inconsistent with the fundamental rights, freedoms and principles that it reaffirms" and "(2) In particular, and for the avoidance of doubt, nothing in Title IV of the Charter creates justifiable rights applicable to Poland or the United Kingdom except in so far as Poland or the United Kingdom has provided for such rights in its national law''. In particular the rights in the Solidarity Chapter such as the right of collective bargaining and action have no direct effect and the ECG will not have the power to control the application of this Chapter in UK and Poland. 10“the cultural, religious and humanist inheritance of Europe, from which have developed the universal values of the inviolable and inalienable rights of the human person, freedom, democracy, equality and the rule of law” 5. 12By pooling basic production and by instituting a new High Authority, whose decisions will bind France, Germany and other member countries, this proposal will lead to the realization of the first concrete foundation of a European federation indispensable to the preservation of peace 6. 14“DESIRING to deepen the solidarity between their peoples while respecting their history, their culture and their traditions”7. 15Solidarity remains a key issue affecting the development of an ever closer union between the peoples of Europe, particularly in the light of the contemporary EU crises: the euro-zone crisis which turned to be a Grexit crisis (the possibility for Greece to leave the Euro-zone), Brexit crisis (the referendum for UK's membership in the EU that took place June 2016 and eventually led to UK's leaving the Union) as well as the refugee and the Schengen crises. It is legitimate to conclude that while peace has been established, solidarity as a further step for the deepening of the process of European integration needs to be addressed. 17The term 'European' has not been officially defined. It combines geographical, historical and cultural elements which all contribute to the European identity. The shared experience of proximity, ideas, values and historical interaction cannot be condensed into a simple formula, and is subject to review by each succeeding generation. The Commission believes that it is neither possible nor opportune to establish now the frontiers of the European Union, whose contours will be shaped over many years to come8. 19We managed to define 3 levels of bonds or ties that the Treaties set: two horizontal and one vertical types of bonds. We defined that the Lisbon Treaty defines 5 types of horizontal bonds between EU citizens-a cultural bond, a civil and political bond, a social bond, an economic or competition. The normative constraints in the Preamble support the idea that Europe, as a whole, lacks a common culture with deeper cultural and emotional significance, common political mythology and symbols. Moreover, the Preamble rather justifies the diversity and supports Anthony Smith's view on Europe as a family of cultures [Smith, Anthony, 2008] that share however some common values. 20 In conclusion, from the normative-political perspective that we chose to be a starting point of our analysis, we could note that the social and the cultural bonds between the EU citizens are particularly weaker and not fully developed in contrast with the economic dimension of free movement of persons. If an ever closer union should be seen in the future, further measures need to be taken, which requires a more specific approach as the domain of culture differs from the economic understanding of Europe as a common market. Culture and cultural diversity, in particular, make the European project an unfinished one. The formation of a common European identity that could underpin the political unification in terms of common values and symbols is a challenge from a theoretical as well as practical perspective. One of the purposes of this paper besides outlining a normative model for European identity formation was also to give further recommendations what measures should be adopted for fostering such an identity. If we stick to the normative spirit of this paper, we have to say that the future of the EU as well as its role as a global actor on the international scene requires it to build an identity for its citizens so that they could identify themselves with the EU as a political community that defends their interest. This, on the other hand, requires an EU citizenship model which binds EU citizens together irrespective of the numerous national, regional and local cultural differences. Therefore, further research is needed what elements could exactly strengthen a bond between the EU citizens that is both cultural but at the same time civic and political: a shared sense of cultural identity that is strong enough to make them support and accept as legitimate the European political construction. 3 H.akan Hyden, and Mark Svensson, The concept of norm in Sociology of Law: www.scandinavianlaw.se/pdf/53-1.pdf, , 17. 4 Hans. Kelsen. The Dynamic Aspect of Law. 1967, http://www.philosophy.hku.hk/courses/law/KelsenNormValidity.htm. 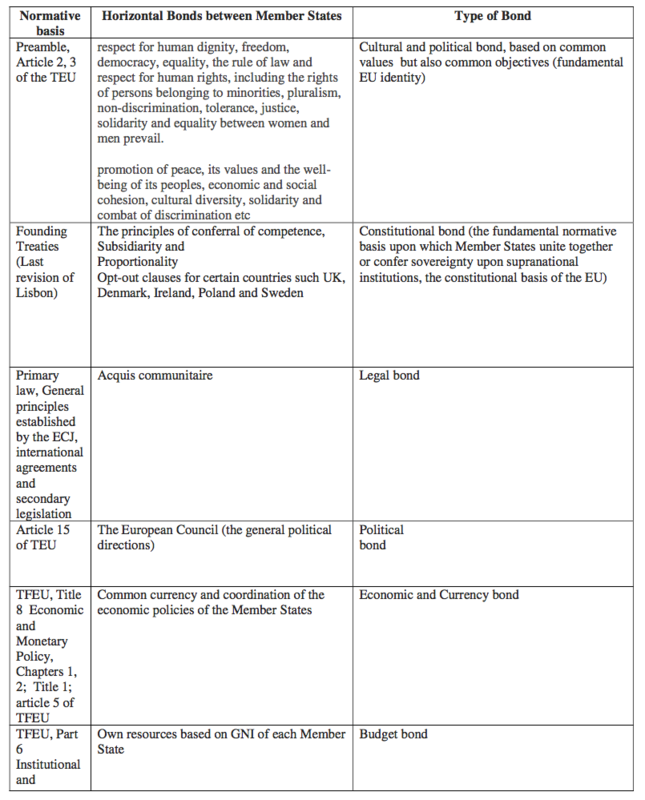 5 Consolidated Version of the Treaty on the European Union, art [Preamble], OJ C 326, 26.10.2012, p. 13–390. 6 Schuman Declaration of 9th of May 1950, http://www.robert-schuman.eu/en/doc/questions-d-europe/qe-204-en.pdf. 7 Consolidated Version of the Treaty on the European Union, art [Preamble], OJ C 326, 26.10.2012, p. 13–390. 8 Chris Shore, Inventing the People's Europe: Critical approaches to European Community Cultural Policy,(Royal Anthopological Institute of Great Britain and Ireland, Vol. 28, N. 4, 1993), 786. 9 Anthony Smith, "National identity and the idea of European unity", (Royal institute of international affairs, 1992, vol. 68), 59. Stella Konakchieva, «The Idea of An Ever Closer Union Among the Peoples of Europe as a Normative Ideal for European Identity Formation», Cahiers de Science politique [En ligne], Cahier n°33, URL : https://popups.uliege.be:443/1784-6390/index.php?id=862.